Thermo Fisher Scientific recently launched a new benchtop line of next-generation sequencing instruments (NGS) called the Ion GeneStudio S5 Series—including the new Ion 550 chip—which features read lengths of up to 600 base pairs and houses five Ion S5 chips that can provide for flexibility across many different research applications. According to the company, the new instrument will allow for experiments in multiple research areas including cancer, inherited diseases, and microbial and infectious diseases, while the flexible chip configuration allows for two sequencing runs per day, with data analysis of between 2 million and 260 million reads. The major feature of the S5 Series is the ability for researchers to switch between the Ion S5 chips to match the required throughput for a given run. This flexibility eliminates the need to switch to another sequencer or to batch samples. The system flexibility allows users to create customized panels for their research needs, such as those available via the latest update to the AmpliSeq technology—called AmpliSeqHD—then choose the most appropriate Ion S5 chip based on the number of genes in the panel. “The Ion GeneStudio S5 Series and the wide selection of sequencing chips provide our customers the ability to configure their targeted NGS experiments with the most flexibility of any bench top system on the market,” said Andy Felton, vice president, product management of Clinical Next-Generation Sequencing and Oncology at Thermo Fisher Scientific. Products in the series include the Ion GeneStudio S5, the Ion GeneStudio S5 Plus, and the Ion GeneStudio S5 Prime systems. 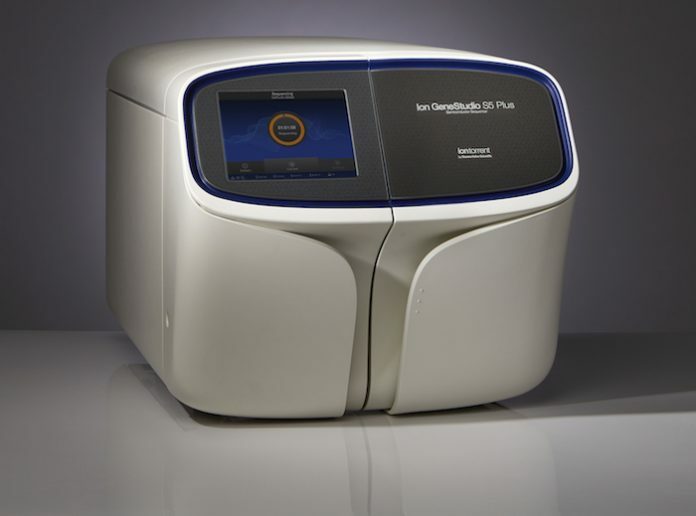 Simultaneous with the launch of the new benchtop instruments, Thermo Fisher also expanded its Oncomine portfolio with clinical research assays for liquid biopsy and immuno-oncology. The new Ion Torrent Oncomine Pan-Cancer Cell Free Assay, which targets more than 50 genes across multiple cancer types, provides for the detection and analysis of tumor DNA and RNA across the major classes of somatic mutations. Results are delivered within two days using a single vial of blood and as little as 1ng of nucleic acid. In the immuno-oncology area, the company has introduced an assay aimed at helping researchers improve patient selection strategies for clinical trials via the measurement of tumor mutational burden. The Ion AmpliSeq Immune Repertoire Assay Plus, TCR beta, can identify population subsets at risk of immune-mediated adverse events. This, combined with the Oncomine Immune Response Research Assay, designed to characterize gene expression in tumor microenvironments, provides researchers with a comprehensive testing suite targeted for immuno-oncology research.